Buying paper cutting tools and supplies can be stressful. It is hard to find a good pair of scissors, or the knife does not work right. How about the paper? Is it too thick to cut? I have had these problems before. Think about it when you buy art supplies at your local store, it is always hard to find that something that you really wanted or needed. Even you find it; the price is always too high. Online shopping is a great way to save your money, and you get a lot of choices than when you go somewhere else to find it. Online stores have a better discount than carriers. You will find a lot stuff that you can not find anywhere else in you local stores. Save your time and gas, go online shopping! Always check on your supplies before they run out, this is another way to save you money. 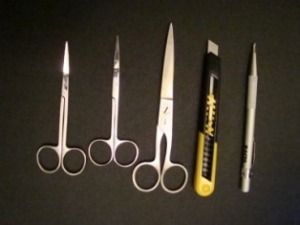 Here is a list of tools and supplies that you need before you begin to cut your piece(s). What Do You Use To Cut The Paper? What do you use to cut your paper-cuttings? Which kind knives or scissors do you like the best? Where did you find your cutting paper? Please Share It!